Both victories in today’s matches of the MEVZA Men’s Final Four tournament presented by Zadruga went to the teams from Slovenia. 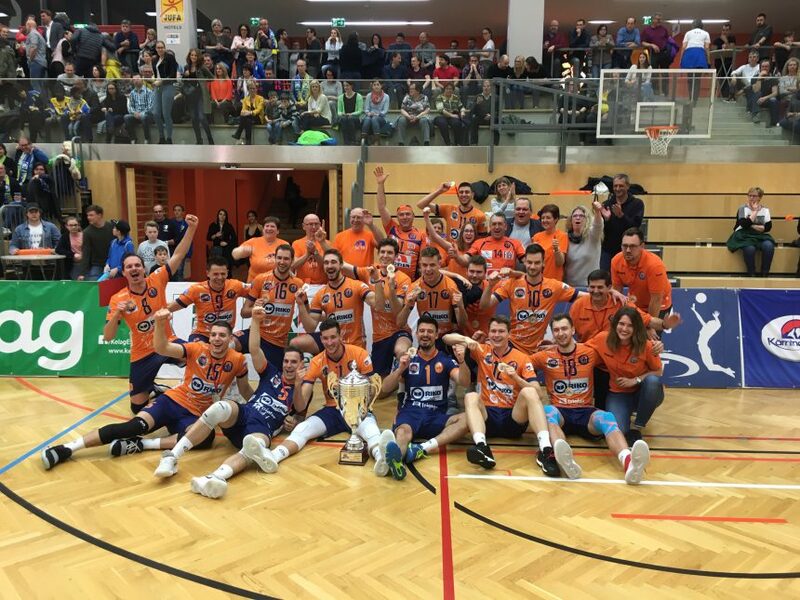 Defending champions and hosts SK Posojilnica Aich/Dob were beaten by ACH Volley Ljubljana in the final in three sets. Union Raiffeisen Waldviertel lost last year’s finalist Calcit Volley Kamnik 1 – 3. The JUFA Arena was sold out with approximatly 1.200 spectators. In the end it was a clear thing for the number two from Slovenia. Calcit Volley Kamnik won against the Austrian runner-up in four sets. Only in the second set the „Nordmännern“ managed to fully challenge the Slovenians. Especially from the third set on, Kamnik was superior to the Waldviertlers in all respects, which ultimately meant bronze for Slovenia. „One noticed the Waldviertlern the long match yesterday evening. And we were able to call up our expected performance in all areas. We are happy about bronze after silver last year“, says Aleš Hribar, Head Coach of Calcit Volley Kamnik. „After the national cup, we won the MEVZA and so our second title this season. Now we are missing the national title for the triple. After our performances here in Bleiburg, we are naturally full of self-confidence and look forward optimistically to the end of the season“. „We arrived here with a bitter defeat from the national championship in our luggage, had to digest third place after the basic round in Slovenia. We did that very well. Against ACH in the semifinals we didn’t manage the sensation again, they definitely didn’t underestimate us after last year’s defeat here in Bleiburg. We are satisfied with the third place and will return home with confidence for the rest of the season“.